The deadline for nomination entries is Wednesday, 20th June, 2018.The organisers reserve the right to reject the entries submitted after the deadline. The official online forms are available at www.mala-awards.com or www.eximindiaevents.com for filing nomination entries. Submission of the entry form confirms that the entering company or organisation understands and agrees to the Rules of the Scheme. Entrants will also be notified by e-mail if they are shortlisted. Judging panel will assess all submissions. 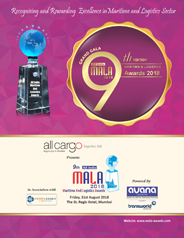 The winner will be announced during the awards ceremony at the 9th All India - Maritime And Logistics Awards 2018 on Friday, 31st August 2018. All the shortlisted finalists, will be informed before the Award Ceremony. Please ensure that the short listed companies depute their representatives for the award ceremony.